Established in 2011, VALEMO, initially a wind-park operator has become in 6 years, a major player in the market. The company has since greatly expanded its range of skills in control and maintenance. VALEMO has also extended to other renewable energies such as photovoltaic and hydroelectricity. Building on this expertise, VALEMO is now committed to renewable marine energy and offshore wind energy. For centuries man has used water energy in water mills. The tidal power plant of Rance (Brittany) was the transition from the use of hydropower and renewable marine energy (RME). The rational exploitation of marine energy can produce electricity exportable to the mainland. RME is a particularly interesting source of renewable energy for France and its islands totalling more than 10,000 km of coastline, as well as internationally, in territories with high marine and river potential. The French government has recently launched several tenders to create the conditions for the emergence of an industrial RME sector. France has many assets in this sense, a huge energy potential, large industrial groups, a solid fabric of SMEs from the naval and RE worlds: consultancy firms, energy companies, etc. French Government MEP (Multiannual Energy Programming) has set ambitious goals for the sector: 3,000 MW of Offshore wind power and 100 MW RME projected in 2023. 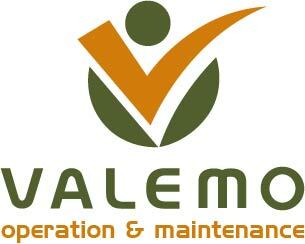 VALEMO, a complete expertise for MRE and offshore wind energy. VALEMO has a team of more than 30 technicians and electrical engineers based in Bègles, Castres, Nantes, Caen, Blangy-sur-Bresle and Reims. Around ten are specialized in the RME-Offshore industry and received additional training in maritime safety. – Calculation software for the sizing of electrical systems, drawing of electrical equipment, analysis of wind power plants’ operating data, CMMS. – Measuring means for conducting technical audits: thermographic camera, electrical network analyser, wind turbine blade control system. – Control Centre, which oversees 7/7, 24/24 collection and collation of measuring device data.